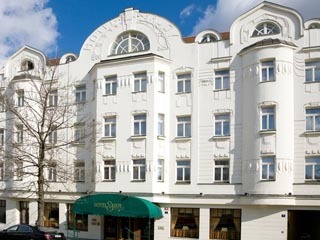 The hotel was open on April 21st in 1909 and built in Viennese Art Nouveau style. The design was the work of František Buldro, a Prague builder and the owner of the hotel, together with George Justice, the architect. In 1924, after Mr. Emanuel Oppel bought the building, Hotel Palace Praha became a sought-after center of social and cultural life and one of the few luxury 5-star hotels in Prague. Hotel Palace Praha´s first epoch of long duration ended on January 1st 1986 when it was closed. After lengthy deliberations among experts and the general public, the idea was formed that the hotel should be thoroughly but sensitively renovated. 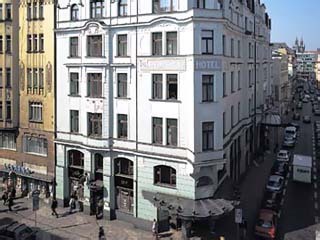 Hotel Palace Praha is perfectly located just in a very city center on the corner of Panska and Jindrisska Street and is within walking distance of the historical sightseeing attractions and close to the business, shopping and entertainment areas of Prague. Junior Suite 3 Junior Suites with king size and 4 Junior Suites with two separate beds - both types are on average 35m² large and have separate living area. Art Nouveau Suite Stylish Art Nouveau Suite on the 5th floor composes of separate bedroom with a twin bed and living room with possibility of connection with a Deluxe Room. Spacious bathroom with a bathtub and shower is decorated with white Carrara marble and equipped with hairdryer, cosmetic set and bathrobes. Opera Junior Suite Opera Junior Suite with high ceiling and stylish furniture is located on the 7th floor with a beautiful view to the State Opera building and the downtown of Prague. The suite composes of a king size bedroom with a noble sitting area. The white Carrara and Rosso Verona marble bathroom is equipped with comfortable bathtub, glass-enclosed shower, separate toilet and built in LCD television and sound system. The Opera Junior Suite may be booked with other bedrooms. Opera Junior Suite is 46m². Duet Opera Suite The Duet Opera Suite is situated on the 7th floor and composes of 2 bedrooms including sitting areas with a great view to the State Opera building and the downtown of Prague. Duet Opera Suite offers a comfort of 2 bathrooms with Carrara and Rosso Verona marble with built in LCD televisions, cosmetic sets and hairdryers. Duet Opera Suite is connectable with a Deluxe Room. Duet Opera Suite is 93m². Palace Suite Unique suite on the 6th floor with a private sauna in classical style. The Palace Suite composes of separate bedroom with a king size bed, living room with a conference table for up to 10 people, private wardrobe, 2 toilets, white Carrara marble bathroom with a large bathtub and shower. LCD TV 32“ in the bedroom and 42“ LCD TV and DVD player in the living room. Palace Suite also offers a possibility to connect with a Deluxe Room. Palace Suite is 127 m². 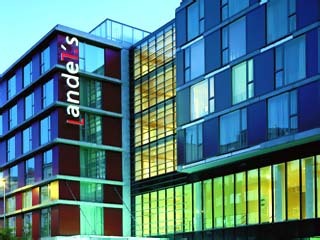 Hotel Palace Praha provides for its clients 3 restaurants with the total of 188 seating capacity. Gourmet Club Restaurant - is the main gourmet restaurant of Hotel Palace Praha. With its capacity of 60 seats and situation right opposite from the main entrance offers wide selection of local and international cuisine as well as unique selection of wines from all around the world. Opened daily from 6 p. m to midnight. Gourmet Club Lounge - is the other restaurant in Hotel Palace Praha. With its products, e.g. breakfasts, lunches, dinners and favorite world-known cocktails is a starting point at 7 a.m. as well as ideal place for a night cup round 1 a.m. The capacity of Gourmet Club Lounge is 42 seats. Restaurant L´Epoque is located on the 2nd Floor. 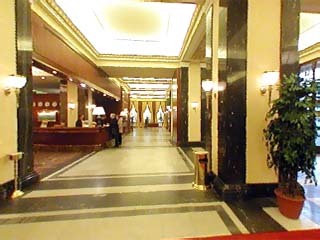 The entrance is either from both elevators or directly from the lobby by stairs. Restaurant's capacity is 80 seats and is mainly used as a breakfast restaurant for all clients. Within seconds it could be transferred into the multi-functional banquet department with the possibility for any gastronomic activities.